Jenny spent a lot of time looking for unique ideas for Christmas cards online. “Something memorable is what I always try to shoot for, since I know it will end up on the Grandparents’ fridge! I honestly had already selected my design for the year from another website, but I struggled, since it felt as though I had already done something so similar in the past. I remembered Pear Tree from an ad and found it through a search. My heart dropped when I came across the Seasonably Bright One Photo Banner Christmas Cards. So different in design and striking with contrast. My favorite is the houndstooth backing, just perfect and very fitting for my little guy. 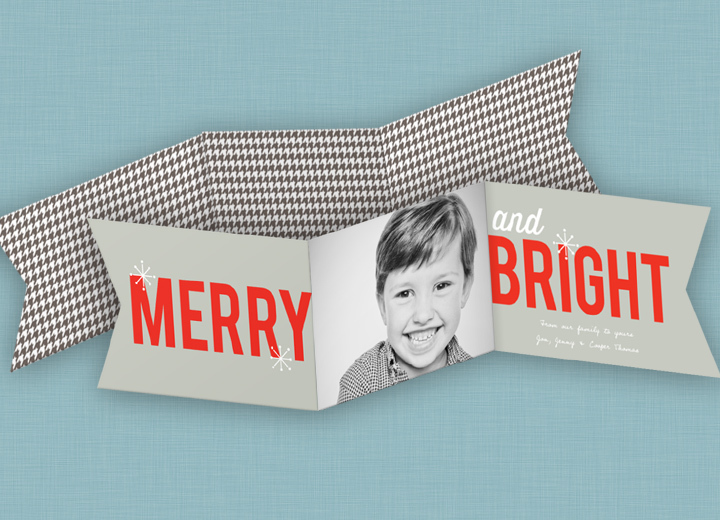 Thanks Pear Tree Greetings for making this year’s holiday card the most memorable yet! When it comes time to start searching for your Christmas cards, look no further than Pear Tree Greetings which was featured in The Wall Street Journal for its photo Christmas Cards! See more Featured Favorites and find more unique ideas for Christmas cards on our blog! Looking for a way to give back this holiday season? Refer a friend to Pear Tree and if your friend makes a purchase, Pear Tree will donate $20 to CaringBridge. CaringBridge is a leading national nonprofit that provides online tools for people experiencing a life-changing health event. Lovely design, adore the fact you can include a photograph in there! Makes it SO special!